Interested in coming to Lead THE Cause? Sign up for updates! YOUR TEENS SHARING THEIR FAITH WITH THEIR WORLD. Lead THE Cause trains teens to be on mission…for life! When High school students and leaders come to this leading evangelism training experience, they come home confident in their faith, knowing how to engage others in gospel conversations, and are lit on fire to see everyone in their world know Jesus. 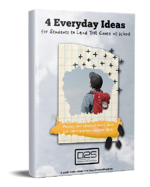 Plus, get the ebook "4 Everyday Ideas for Students to Lead THE Cause at School" for free when you sign up!